After a great time in Berlin (a city I will be visiting again, if not living in), Dad and I hopped on a train for a quick, one-night stop in Prague, Czech Republic, while en route to Munich, Germany. We were now in the country that we both knew the least about. We knew zero Czech words and we had none of their currency either; they aren’t on the euro. As we were pulling into Praha (Czech name of Prague), there was a noticeable difference in the language and writing on the signs. There were also relatively a lot of regular people walking around and across the train tracks. It also looked rather run down. Maybe that’s just what the old communist states look like. After figuring out the exchange rate of euros (and, in the back of our heads, dollars to euros) to crowns, we were off on the metro in search of our hostel that we got for 12 euros per person! At the time, 1 USD was about 20 crowns. It was cloudy but not too cold, and, knowing we were there for only one evening and were departing to Munich in the late morning, we had to get out and explore. We had dinner at a local restaurant of goulash and some beef with cranberries and drank Budweiser Budvar. Yes Budweiser, but it’s not the American kind. Google ‘Budweiser in the Czech Republic,’ and you can learn about it. With filled stomachs, we went off on foot in search of the Prague Castle which I have been wanting to see for years. I would have loved to have taken a tour or caught the castle at sunrise too, but this will have to do for my first visit there. We kept walking and wandering around the city as we tried to absorb all the sights and sounds we could. The next morning, we had a big breakfast at the restaurant at the hostel and were off for a few more hours of exploring before we had to grab our bags and head to the next train. Our stay in Prague was nice, but just too short. There was so much I just didn’t get to see. If I were doing it again, I’d cut out the city completely and spend another quality day in another city instead of hours on the train and just a few hours exploring. Quality over quantity. A number of hours and a couple of trains later, we were in Munich. I was really surprised at how happy I was to be back in a German-speaking country. I’ve only ever taken about 4 classes of the it in 6th grade, but I remember it quite well. Maybe it’s my German heritage trying to call me back. We had a tasty dinner of sausage and Augustiner at a beer garden and were in for the night. We caught up with a guided tour of Munich for a brief intro to the city and spent the rest of the day walking and hopping on the metro. A tasty kebab from an all-hours restaurant near the train station later and we were in for the night. I performed a quick, YouTube-guided surgery* (Hi, Dad), and we figured out logistics for our visit to Dachau in the morning. Our guided tour of Dachau was an important goal of mine. I wanted to get a better feeling for the horror of World War II and what my grandfather was fighting to end. The stories and history we heard were interesting, but I was surprised at how unemotional the tour was for me. It was challenging to think of the terrible things that happened there and across Europe, even through the pictures and a few of the buildings that were still around. It was hard to imagine something so awful happening from my modern day perspective, but I’m very glad we went and experienced it. We made our way back to Munich, a 30 minute train ride, and checked out some of the department stores near Marienplatz. When I go to Germany again, I’m buying authentic lederhosen. A couple days of drinking Augustiner, eating sausage at every meal and hearing some funny maypole stories in Munich were over, and we were off to spend a few in Rome! For more of my traveling adventures and to see the previous EuroTrip posts, click here. After a spending a couple of days in Amsterdam, Dad and I were off to Berlin, Germany. After another train ride, we arrived at Berlin Hauptbahnhof. This massive station is a gorgeous, glass, German Goliath. Unfortunately we arrived on a nasty, cloudy day, and it began to sprinkle once we stepped outside the station. So just trust me, this station was super nice. We made the mistake of not packing food or eating on the train (yes, there was a dining car) so we were very ready to eat. We grabbed a bus and headed to our hostel, St. Christopher’s. It’s actually a chain of hostels around Europe that has a bar, Belushi’s, on the ground floor and then rooms upstairs. We had such a good experience there that we stayed at another St. Christopher’s in our next city, Prague. After checking in and unloading our stuff, we got a recommendation to go to Hofbräu Berlin. I desperately needed food. I was hangry. Real hangry. After we stuffed ourselves at the restaurant with mixed sausages, potatoes, a pork knuckle for Dad, and German beer, we dodged raindrops as we walked back to the hostel through a steady rain. I updated my Twitter followers, Dad and I planned out what we wanted to see the next day, and we called it a night. We woke up to cloudy skies, cool temperatures, and an aggressive, face-numbing wind. We went on an easy-going, 4-hour walking tour of the city where we visited many of the big sites around Berlin and heard some informative history that gave us a solid intro to the city. I’m a big fan of the walking tours — especially the ones in cities that have lots of history, like Berlin. Sure, I learned a little bit about Berlin in school, but nothing close to what I got from the tour guide. It’s a nice way to start a city. I think it ended up being my favorite tour of the whole trip. No, I didn’t burn the foreground in post. The sun burst through the clouds to illuminate the trees just beyond the Memorial to the Murdered Jews of Europe. After doing some research in Amsterdam and asking the bartender at Belushi’s for recommendations on where to go to get good currywurst in Berlin, Curry 36 came up. It was dee-licious. I could eat that once a week. It was very affordable, too. Ahh, an American flag. This is the US Embassy in Berlin. 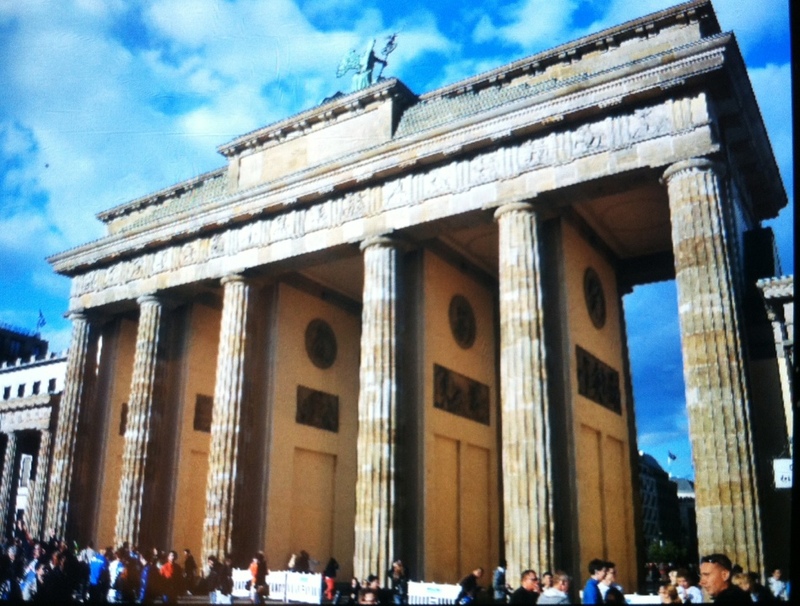 It’s ~50 yards from one of the most iconic symbols of Berlin, the Brandenburg Gate (seen below). There was a large race (run, walk, and rollerblade) kicking off later that evening when we made our way back to the Gate. The teams above were on inline speed skates. Fun fact: if you’re in Berlin and see this guy on the crosswalk sign, you’re in East Germany. If you see a more standard type of guy with his arms down, you’re in West Germany. After the race had come to an end and we walked along the dozens of vendors and tents, we walked toward Reichstag to grab a couple shots of the sunset. One full day down and one to go. We awoke to sunny, much less windy morning. After a bit of wandering, we wound up at Alexanderplatz and under another icon of Berlin, TV Tower. If you know the story behind the Trabi, you get the irony. The next stop on our cross-town tour was the longest remaining section of the Berlin Wall. It’s about three quarters of a mile long. On the opposite side of the wall seen in this photo is the East Side Gallery. A sample of the actual art is on the photo above this one. It’s amazing to think about this wall-turned-public-art-exhibit causing so many issues just 20-some years ago. After stopping at one of the recommended kebab restaurants for dinner, we were off to Potsdamer Platz, the home of the Sony Center. But on our way to Potsdamer, we passed through the Klosterstrasse Station. We hopped off the train to take a picture of the station. It’s always cool when you see your last name, or at least part of it, as the name of a U-Bahn (metro/subway) station. We made it to Potsdamer Platz and the Sony Center as the sun was coming out from behind the clouds. It has fantastic architecture and design. This photo doesn’t do it justice. It’s a huge entertainment, bar, and restaurant area. The light pockets that shine in throughout the day must be a photographer’s heaven. We left Potsdamer Platz and set off for the zoo. We ended up finding it, but unfortunately it had closed for the evening. We did manage to find a random park party/concert with some nice German-ish reggae. It’s also the home of the $1,600 baby stroller that my Dad thought my sister Shannon would love. After walking block after block and still finding more swanky stores, it was now almost completely dark and time for us to head back into the city. Berlin was one of my favorite cities. I’m not sure why it is, but I’ve made a list of my top ten reasons that I can put my finger on. I really want to go back and explore some more… and maybe even live for an extended period of time. German seems like a language I could get used to. I took maybe four German classes in 6th grade. I still remember how to count from 1-10. The doors to the S and U Bahns will open before the train comes to a complete stop. Sure it’s relatively less safe, but it’s a more efficient and faster way to unload passengers. With two fun, full days plus an evening spent in Berlin, we were off to our next destination and the place we knew the least about: Prague in the Czech Republic! Leave your 2¢ below, or hit me up on Twitter. Guten tag! I wanted to give an update on what I’ve been up to. My dad arrived in Madrid this past Tuesday, and we’re on a trip around Europe. We flew to Brussels, Belgium and then took the train to Amsterdam in The Netherlands and then, here, to Berlin. We’re about to grab another train to Prague, Czech Republic. I’m actually writing this using the WordPress app on my phone since I decided to leave my computer in Madrid. After Prague, we’ll be heading to Venice, Rome, Geneva, Barcelona, and finally Madrid. Those cities are subject to change, but that’s the general route. We’ll get back to Madrid around the 12th so I can show dad more of Madrid and get packed up at my flat. We’ll both be flying from Madrid to Ohio on Friday, June 15. To follow along our route with a couple updates a day, follow me on Twitter or Facebook. On the heels of a nice day trip to Cadiz, I found myself on another beautiful day in Andalusia with plenty of time. Excellent. Let’s shoot, shall we? While this may not look like much food, this is my impression of an average Spanish breakfast. That’s a cup of café con leche (coffee) and bocadillo de jamón (Iberian ham on bread). Before coming to Spain, I had only ever purchased/tried to drink a cup of coffee once before. It was a terrible experience, and needless to say, I didn’t finish the cup. When I got to Spain, I saw everyone always drinking café con leche. Hey, I came abroad to see how people do it over here. One day at school a few weeks back, I mustered up my courage and got myself a cup. After the first sip, my face cringed like a baby that just poohed his diaper. “How can you all drink this stuff?” In a spirit of penance, I finished the cup. Right before the rain came in Cadiz yesterday, I ordered another cup hoping my mom’s assertion that ‘taste buds change over time’ would ring true. It did! And who knew, sugar helps! So on this morning, I ordered it again. I’m learning to like this tasty way of jump-starting the morning. These floats aren’t driven by machine power; it’s all man power. As the floats wind their way through the brick streets, new groups of men trade places with the sweat-soaked ones that have been giving the float its feet. One more post remaining from spring break! Stay tuned! If you missed part one, it’s here. I made a friend on the bus coming back from Granada. Mar lives in Madrid, but she’s originally from Cadiz. She offered to show me around Cadiz if I was in Cadiz the same day she was in the area. Personal tour guide? Yes, please! So on the second day in Sevilla, I was off to Cadiz. I thought I woke up early, but after speaking with the front desk folks at the hostel, they said I’d have no chance of making it to Santa Justa station by foot in time. With many of the roads blocked for the Good Friday procession routes, my choices were take a cab or miss my train. Cool. Although the ticket wasn’t expensive, I didn’t to miss the train. As I was running to the cab corral a few blocks away, I grabbed this frame as the sun was throwing out some amazing light as it was streaming through the streets of Sevilla downtown. After a cab ride that seemed to take forever with all the traffic and road closures causing more than enough congestion around the city, I made it to the station, and all-out sprinted to my train. Made it. Whew. Once I got to Cadiz, within my second cup of café con leche, the ominous clouds that had been rolling in finally exploded. It rained, and it rained hard. Luckily within an hour or two, it cleared up and gave way to some beautiful light and a bright blue sky for me to play with all day. Deep blue skies courtesy of the Nikon 77mm circular polarizer. After a solid day of picture making and walking around, I was headed back to Sevilla on the last train from Cadiz. It was definitely worth a day trip, but it’s by no means big. One day was enough for me. After a two hour train ride, I was back at Santa Justa station. I finally took time to work with all its symmetry and lines. On my way back to my hostel, I ran into a paso (procession). This is what Sevilla is famous for. I’ll let Wikipedia do the talking here. What they don’t tell you on Wikipedia is that if you get caught in one of these processions, you better not have to go to the bathroom or have anywhere to be. A tour guide said he was trapped for hours during one of the pasos. They happen all week in Sevilla, but also to a lesser extent in other cities around Spain. After a long day of shooting and walking (that seems to be the theme with my trips around Spain), I was beat and ready to hit the hay. Next up will be from my second day in Sevilla. Easy email update sign up is at the bottom of the page. Add http://www.ethanklosterman.wordpress.com/feed into your RSS reader. Give me a shout-out on Twitter–@Leetol. Comments, questions, etc. right below! Spaniards call Easter break “Semana Santa” (Holy Week). I was off to Sevilla and Cadiz in Andalusia in the south of Spain for a few days of picture making. This is day one and part one of the trip. If one was to drive to Sevilla without stopping, it’d take just under 6 hours. I rode the high speed train on the right. At speeds near 186 mph, I was there in 2.5. Fantastic! These trains were smooth-riding, had more leg room than airplanes, two AC outlets at each couple of seats, bathrooms, a dining car, movies, complimentary headphones, and no small overhead compartments that I had to worry about getting my stuffed ThinkTank bag into. To top it off, there were no stops (at least on the trip there), and I got to see the countryside. The sun was trying to peek out midway to Sevilla on the AVE. Lighter and a note from a poor person requesting money in exchange. Very often a poor kid will leave a note and a small pack of tissues on the Renfe train or Metro in Madrid when I’m going to the Cantoblanco campus. “Metropol Parasol” in Plaza de la Encarnacion in Sevilla, Spain. It was designed by J. Mayer H. and completed in April 2011. This was one of my very favorite parts of Sevilla. It is the world’s largest wooden structure. I watched a video about it a few days ago, and found out there’s a walkway on top. I wish I would have known that was an option when I was there! Oh, and it only cost a cool 90 million euros to build! This is the traditional outfit that hundreds of men, women and children don for processions (pasos) during Semana Santa. Yes, they do look like the KKK. To be clear, these garments were Spanish before they were adopted by the KKK in the early 1900s. These people were all in line to get into a church on Holy Thursday. The line extended even further than is visible in this frame. This is part of the traditional outfit worn by many adult women in Sevilla during Semana Santa. All of these chairs were set out for spectators for the famous Sevilla processions. There had to have been tens of thousands set out around the city. My next post will be all about my day trip to Cadiz. If you have comments, drop them below. Thanks for stopping by. If you’d like to get email notifications when I post new pictures, sign up at the very bottom of this page! No, I won’t spam you. If you’re into RSS like I am, that option is there too. Weather forecast: sunny and dry. School/work: none. Three day weekend: of course. Perfect recipe for a weekend out of Madrid. My friend from Comillas, Avery, and I decided late on a Thursday night last month that we should get out of Madrid. Just a few hours later, we were sitting on a bus headed for Granada in the southern autonomous community of Andalusia for the weekend. The trip only took four and a half hours of actual driving and took us through scenic mountains and pretty countryside. Regarding the transportation, this bus wasn’t your average American Greyhound. In fact, this cruiser put all Greyhounds to shame. It was on time, very clean, had TVs throughout, had no unusual stench, no mystery stickiness on the floor, and had comfortable seats. Pretty great for around 25€ round trip. OK, I’ll let some pictures do the story-telling. I asked the front desk at the hostel (White Nest Hostel– highly recommended. Clean, extremely friendly, good location, free Wi-Fi, reasonable price, hot water.) where the best photo spots were, and she recommended a few streets north of the main drag that had some nice graffiti. The hostel also recommended we hike up the hill across from Alhambra (Granada’s main attraction) to watch the sunset. Avery and I took some shots of each other that are in my Facebook album. The locals hang out and drink, while the artisans sell their trinkets and jewelry to the other tourists that hear about this great spot (and have the endurance for the hike up the hilly, rough streets). We booked the ~14€ tour tickets for Alhambra. It was definitely worth the $18.75. If you’re planning a visit, book the tickets one day in advance and have a solid 3 hours to see everything. We bought tickets for the 2 p.m. slot, could see everything, and the light was great throughout. I took a peek through the Granada postcards and a coffee table book of photographs when we were downtown. They gave me some solid ideas on where to shoot. This kind of detail was everywhere. Whatever you’re imagining as “everywhere,” triple it. The intricate designs were amazing. It’s amazing to be walking through and shooting a 14th century castle. After Alhambra, there’s also the Generalife Palace that is included with the ticket. We had to zip through this area to catch our bus back to Madrid, but I still managed a few frames. There are rows and rows of olive trees much of the way to Madrid. We had a great sky and sunset as we were riding through the mountains back home. It was a fun weekend of picture-making and exploring. A few comments on street shooting. It ain’t easy. There seem to be infinite options. Props to folks that shoot it and shoot it well. It’s an ongoing challenge for me. Street shooting makes me miss my sport shooting days at UD. Don’t forget to add “www.ethanklosterman.wordpress.com/feed/” to your Google Reader or other RSS reader. A few friends and I took a day trip to Toledo, a quick 48 minute bus ride from Madrid, a number of weeks ago. We just stayed a few hours. This is what I saw. Don’t forget to add “www.ethanklosterman.wordpress.com/feed/” (without quotes) to your Google Reader or RSS reader of choice. My posts will be delivered to you instead of the other way around. I highly recommend it. Catch up with me on Twitter too.